This Sunday, in Week 21 of La Liga, Leo Messi broke the 200-goal barrier in the domestic competition. The Argentine’s most recent victim was Osasuna, more specifically, Osasuna’s keeper Andrés Fernández who collected the ball from the back of his net five times this evening. 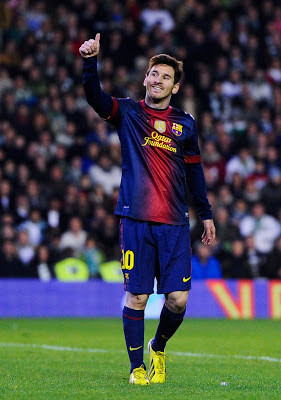 Overall, Leo Messi has scored 202 goals in his 235 La Liga matches, his goalscoring average is 0,85 goals per match. Labels: Lionel Messi, Messi crosses La Liga 200 mark.